As autumn deepens, the leaves become lighter and brighter. 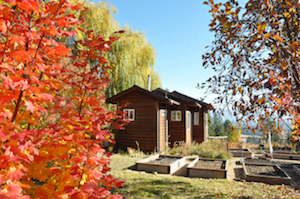 Autumn at the Abbey is gorgeous with multicolored trees in the forest and the garden. The veggie garden has a few remaining squash and the flower garden has pretty much gone to sleep except for the blazing blue columbines, scarlet cosmos, and bright orange calendulas. Enjoy Autumn at the Abbey photos and beautiful photos of Abbey life by Methodist Minister and photographer Reverend Gen Heywood. For the fourth year in a row, we’ve had the privilege of studying Aryadeva’s Four Hundred Stanzas on the Middle Way with one of the great scholar-practitioners (and one of the most humble), Geshe Yeshe Thabkye. Now 88, Geshela teaches with the exuberance of someone decades younger. Unable to travel cross-country from New Jersey to the Abbey, he taught the eight-day course (two sessions a day) via livestream to a group of eager students at the Abbey, with translation by Joshua Cutler. These precious teachings are challenging to understand, but they hold the key to generating the wisdom that will liberate us from cyclic existence. Ven. Chodron led a Q&A session after each teaching, helping us apply what we’re learning to our lives. In March of this year, Ven. 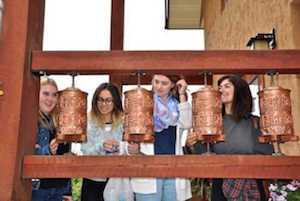 Chodron completed 40 years of monastic life, and the Abbey celebrated this on October 28. 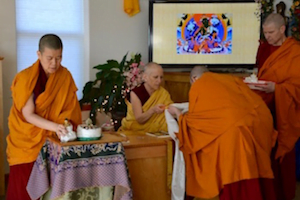 About 75 people attended the whole-day event with a puja of Four Mandala Offerings to Cittamani Tara in the morning, followed by a delicious potluck lunch. While I wasn’t looking forward to the celebration (I don’t like being the center of attention and besides I didn’t want to get a swollen head), I had a great time. So many people offered practice commitments—this is the best offering to make—and I was touched how deeply the Dharma has impacted so many people and moved by their confidence in the Buddha’s teachings. For the third year, a group of about 60 high school students from Sandpoint, ID visited the Abbey in conjunction with an anthropology course and a world cultures course. Ven. Chodron delivered the opening talk, introducing them to the Abbey and Buddhism, and then other monastics took small groups on a tour of the Abbey and led them in a short meditation. We had lunch together, and then they departed. The students were very curious, asked excellent questions, and enjoyed themselves very much. Ven. Chodron spoke on “Finding Hope in Troubled Times” at DePaul University in Chicago, at the invitation of her friend from college who is a professor there. 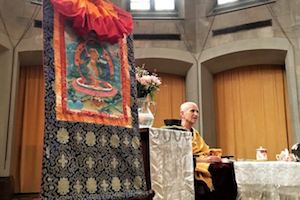 She then went to Cleveland to share the Dharma—speaking on Good Karma: How to Create the Causes of Happiness and Avoid the Causes of Suffering and leading a Vajrasattva retreat with folks at Jewel Heart there. Listen to the public talk here and Vajrasattva retreat teachings here. Her trip then took her to New York where she managed to stay in Manhattan without going nuts! 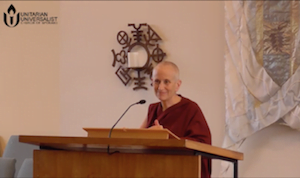 She spoke twice at the Jewel Heart Center there, at Bob Thurman’s Tibet House US, and also at a Japanese temple rented by Shantideva Meditation Center on “Was the Buddha an Activist?” which you can listen here. They all then headed to Garrison Institute, about an hour and a half up the Hudson River, where Ven. Chodron led a retreat on Practical Ethics and Profound Emptiness: A Commentary on Nāgārjuna’s “Precious Garland .” Retreat recordings will be posted online soon. Ven. Chodron also had a chance to visit with some Israeli friends she hadn’t seen in about 15 years, who now live in New Jersey. It was a wonderful trip, and she was happy to return to the Abbey. See her travel photos here. 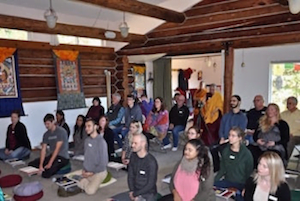 Venerables Tarpa and Losang returned to Airway Heights Correction Facility in mid-October to lead meditations, teachings, and discussions on Ven. Chodron’s book, Good Karma: How to Create the Causes of Happiness and Avoid the Causes of Suffering . As usual there was a mix of participants, including some newer to the Dharma and some who have been practicing for a while. 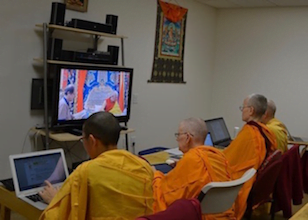 They had lively discussions on karma and Buddha nature as they completed the introductory material about the Buddhist worldview in that text. The men continue to ask many questions and are engaged in turning their minds to the Dharma as they see its usefulness in their lives. Both Venerables think they are learning more than they are teaching, as the inmates’ sharings are rich in meaning. Photo by Asher Isbrucker and Maciej. Ven. Chodron gave two different Sunday morning sermons at the Unitarian Universalist Church in Spokane. Recordings of the livestreamed services are here (Select “Sustaining Hope through Social Action”). Then Ven. Chodron unpacked its meaning: In general, the American Way is to distract ourselves from the increasingly present occurrence of adversity and suffering in the world. However, doing this doesn’t help ourselves or others. Sickness wakes us up to the fact that samsara is not bliss and we need to cultivate the aspiration to be free from it. The adversity we encounter reminds us that our own previously created karma is involved—that is, we harmed others in the past and the karmic result is now ripening for us. This motivates us to improve our ethical conduct. Adversity also invigorates our empathy for others by helping us to understand their experiences and respond with compassion. For many years, the Abbey and the church have worked together for social justice, and for ten years now, the church has requested us to lead a weekly meditation class there. Abbey nuns return from these classes rejoicing in the way the participants are transforming their minds. Monday night meditation classes at the Spokane Unitarian Universalist Church run weekly until December 11. On the first Saturday of October, the Abbey hosted its monthly Sharing the Dharma Day, opening its doors to over 40 attendees. The day’s festivities included a meet and greet over tea, a Dharma talk followed by discussion groups, and a vegetarian potluck. The Dharma talk was on compassion, based on Dr. Russell Kolts and Ven. Chodron’s book, An Open-Hearted Life. Ven. Samten gave the talk and her words were inspirational; she described compassion as a skillset we can cultivate, which can empower us in the face of suffering and oppression. She likened this to the “battle-ready status” maintained by emergency response personnel, who at all times are prepared to draw upon their training. Those who have trained in compassion benefit from their core sense of resilience and readiness to bear both their own and others’ suffering. Compassion is neither an action, nor a limited resource, but an initial mindset influencing all following actions, and it grows in capacity with use. Ven. Samten illustrated her talk with vibrant examples, one of which involved the plight of a Canadian soldier lost behind enemy lines during the Second World War, surviving to return home due to the efforts of an underground railroad network of Europeans who practiced compassion in the face of oppression. Suffice it to say, the discussion groups that followed had much to contemplate, to share with each other, and to take to heart. If you’re interested in experiencing the Abbey and have a chance to dip your toes in the Dharma, join us for the next Sharing the Dharma Day on November 5. We accomplished so much with the enthusiastic energy of many volunteers during October’s Offering Service Saturday. Patricia prepared some garden beds for winter, cleaning up dead foliage and trimming perennials. The kitchen crew (Julia, Karen, and Matt) peeled and cored freshly picked apples for applesauce. A large team of folks ferried six truckloads of seasoned firewood down the chute into the wood room in Ananda Hall, while others stacked it near the furnace. 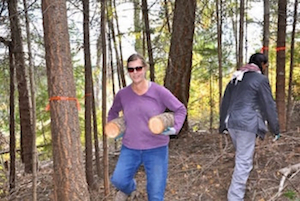 We spent the rest of the day hauling four foot lengths from the forest that Ven. Losang had felled the day before. Meanwhile, Dave spent the day cutting up old maple lengths. Sarah supported us from home, sending yummy butternut squash stew and apple cobbler. It was a very productive day, and also great fun! Tracy offered the Abbey community tickets to “An Inconvenient Sequel: Truth To Power,” Al Gore’s second film on climate change. Although this film was released at the end of July, it predicated the environmental devastations we’ve seen in the last month: floods from horrific hurricanes and the massive fires in California. We highly recommend that you see the film and take whatever steps you can to draw attention to climate change and to remedy us human beings’ effect on it. Watch Ven. Samten’s video showing the roof shingles and solar panels being put on the roof. Prajna House is the first solar powered building at the Abbey and enough electricity will be produced to sell some back to the PUD. Instead of stucco finishing on the exterior of the building, we decided to use hardy plank—another durable, green product. Putting this on is in process. On the interior, the sheetrock is on and the mudding and taping done. Next comes the texture and then paint. The feeling inside the cottage is good and the view is fantastic! We’re hoping Ven. 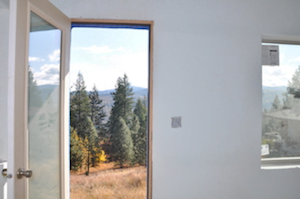 Chodron will be able to continue to write there and not spend all her time gazing out the window! See the latest building photos here. Many of you have been to the Abbey and seen the exquisite stained glass windows our friend Beverly Brecht has made of Mahapajapati in Gotami House and of Thousand-armed Chenrezig in the dining room. 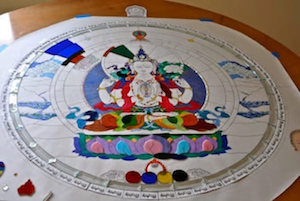 Bev recently paid us a visit to show us the plan for a stained-glass window of Four-armed Chenrezig which will be in the Kuan Yin room in Chenrezig Hall. We also marveled at the beautiful combination of colors and her devotion to detail in creating this work of faith which is also a work of art. The window will be ready in several months if all goes well. Read Bev’s reflection on how working on the windows has inspired her practice of generosity. Another change in Chenrezig Hall is in the chapel. Ven. Jigme’s nephew Shane (who also made the trail signs for the Abbey and other wood engravings) made frames for scores of Chenrezig tsa tsas (small plaster figures) to be placed on the wall on either side of the chapel altar. Alaya donated the tsa tsas; they were among the 111,111 she made as a preliminary practice (ngondro). When we now walk in the room, the effect of being in the presence of many Buddhas of Compassion is felt immediately. Mandala Magazine interviewed Ven. Chodron about The Library of Wisdom and Compassion , the series His Holiness the Dalai Lama and she are co-authoring. The first volume, Approaching the Buddhist Path , was released in August by Wisdom Publications. Read the interview here. Ven. 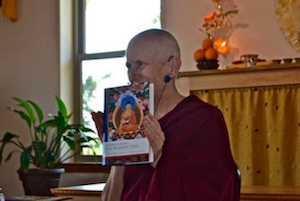 Chodron also shared about the process of editing Practical Ethics and Profound Emptiness: A Commentary on Nagarjuna’s “Precious Garland” by Khensur Jampa Tegchok with Mandala Magazine. Listen to the interview here. Just Talk, a podcast by Spokane media producer Kristian Anderson, interviewed Ven. Damcho about her upbringing in Singapore and her choice to ordain and move to Sravasti Abbey in the USA. Listen to it here. read a letter by 11-year-old C.J. to Ven. 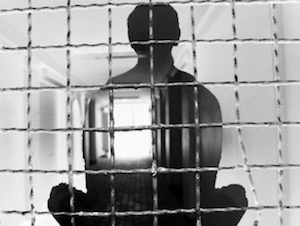 Chodron on why he took refuge—it gives us adults food for thought! read Ken’s reflections about two kinds of prisons.